1In a large pot, bring the milk to a simmer (190°F). Remove from heat and add the vinegar, stirring only once. Put the lid on and leave it for an hour. 2Gently scoop out the curds with a slotted spoon into a sieve (Pierre suggested a cheescloth-lined colander, which would work too, but if you don't have cheesecloth no biggie) - if you like, let it sit in the sieve overnight in the fridge to drain - you can leave it until it's as dry as you like. 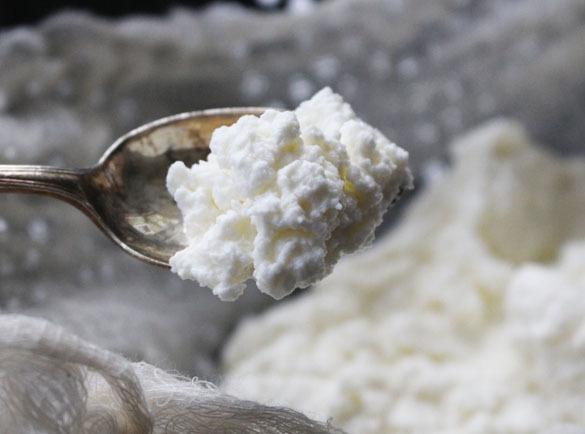 Keep the whey in the fridge and use it for baking, soup, etc. 3Makes about 1 lb. fresh ricotta.